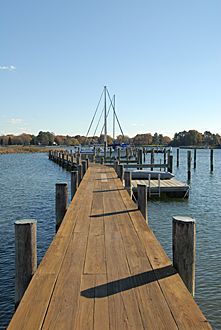 This year Julie and I made plans to spend Thanksgiving with her family in St. Michaels, Maryland. In the past, I have always gone home to spend Thanksgiving with my parents. It’s not just the fact that my Mother is a great cook, it’s also important to me to spend quality time with the ones I love and don’t get to see often enough. This goes both ways now that Julie and I are married… now there are ‘two families’ that we have to think about spreading our time between, so we have decided to alternate the holidays between each family and each year. This year we spent Thanksgiving with Julie’s family and next year it will be with mine… that’s as fair of a trade off you can get I think. We did have a great time in St. Michaels (as we always do) and it is always nice to spend time with Julie’s folks. However, it was unfortunate that Julie’s sister and her kid’s were unable to attend this year due to issues with her husbands company. We really did miss you guys and we hope you had a nice turkey day and all is well up North! We will get together soon! !